The astronomers behind a universe-mapping satellite have released the project’s final set of processed data. What you see above is the newest image of the oldest visible light in the Universe – microwave radiation from just a few hundred thousand years after the Big Bang. The European Space Agency launched the Planck satellite in 2009, and the telescope finished taking data in 2013. The researchers released the first dataset in 2013, another in 2015, and now the final, “legacy” dataset last week – but it doesn’t answer all of the remaining questions about the early Universe. The Planck mission measured the cosmic microwave background (CMB) to the greatest precision yet. After the Big Bang, physicists think that the Universe quickly inflated, then began cooling down and slowed, though it’s still expanding today. Light bounced around until 380,000 years after the Big Bang, when atoms began capturing electrons, after which the light traveled unimpeded until scientists measured it here on Earth. The expanding Universe stretched out those light waves so much that they became microwaves. This light is visible in every direction we look, and it represents the structure of the early Universe. The CMB light is incredibly uniform. Though it looks red and blue on the map, these colors represent temperature differences of tiny fractions of a degree, averaging out to 2.7 degrees above absolute zero. 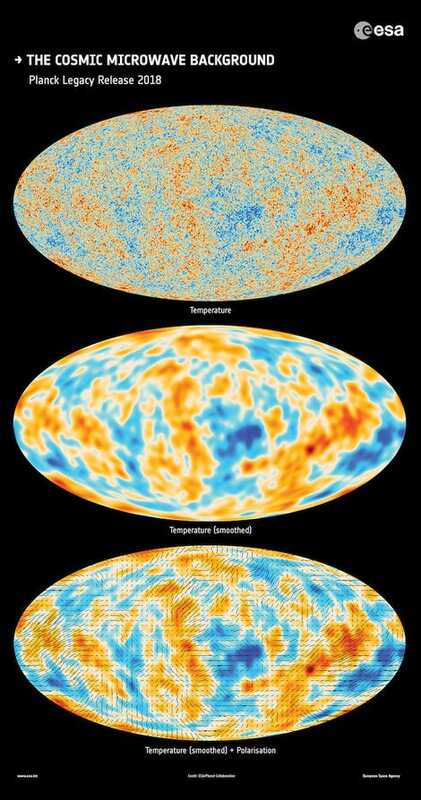 You might wonder why Planck’s scientists have released this map in 2018, when the satellite finished taking data in 2013. The 2015 dataset was limited, because the polarization data, or data about the direction the light wave pointed perpendicular to its direction of travel, was not of high enough quality. The most recent data has been reprocessed, giving scientists more confidence in the polarization and temperature data. But many questions about the polarization still remain, reports Nature. The CMB offers evidence in support of the current understanding of the Universe, one full of dark matter and dark energy. It also supports cosmic inflation, and offers a way to measure the rate that the Universe is currently expanding. The most recent measurement of this rate, the “Hubble constant,” is 67.4 km/s/Mpc. That means that for every 3.26 million light-years separation in distance (megaparsecs), the Universe expands another 67.4 kilometers per second, or 150,769.5 miles per hour. That’s just Planck’s measurement, though, and it doesn’t match up with other measurements taken by the ESA Gaia satellite or the NASA/ESA Hubble Space Telescope, which measure a Hubble constant of 73.5 km/s/Mph. This is a major outstanding question in physics, and researchers are looking for other ways to confirm the Hubble constant. Nature reports that scientists have moved on to other missions, but some worry that there won’t be another space-based CMB mission soon, given that past missions, like BICEP-2, have been unable to answer questions about inflation. There are still tons of outstanding puzzles, though, and scientists worry that some expertise will be lost without researchers studying the CMB.